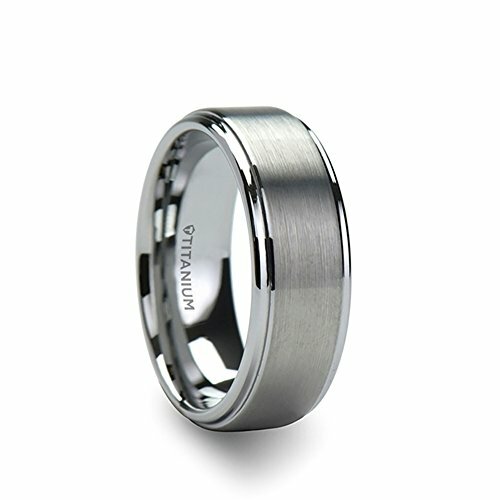 Designed in titanium, this ring adds a contemporary twist to the classic wedding band. Its raised center is exaggerated with a brushed finish while its polished step edges have a rounded finish that complete the look. The inner band is also rounded for increased comfort an easy slide. This ring is available in an 8mm width. You may find similar ring styles in our raised center wedding bands collection. Titanium has more durability than gold, platinum, and even stainless steel. It?s a popular choice for jewelry because it?s strong yet lightweight and will not crack under pressure. Titanium is also a hypoallergenic metal that does not contain nickel, making it a great choice for people with sensitive skin.